It happened again! Being back home, it still wakes me up in the middle of the night. 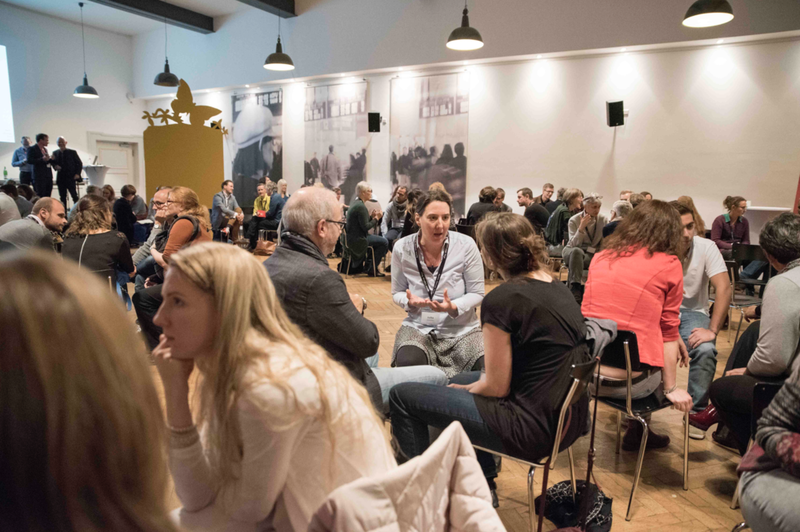 3 intense days of immerse learning, connection, and emotions at the 10th anniversary of the Berlin Change Days Conference. Once more, I left this conference slightly transformed. I left with the feeling that I did a step forward regarding my personal growth. And this is for me the ultimate success factor for an event; you leave different compared to the way you entered. 1. Don’t do it alone. Co-facilitate and host yourself at the same time. When there is an intense process combined with an expectation for a rich outcome, no matter the duration of the event, a facilitation team is the best constellation in order to create essential transformation results. There were moments, no matter how present I have been in the “Here & Now” that I needed to breathe, even for a minute. I needed to host myself in a way that I find again my ground. But how could one host themselves and take a respite when they are in the middle of the fire? This happened to me only when I took the courage to turn to my co-facilitators and say: “Please could you take over my part for a minute? I need to breathe.” And it felt so appreciative for them to ask for their support. It may sound like a selfish act at the moment but I realized that a selfless care for the participants simply doesn’t work. It is necessary to include the nurturing of one’s self as a facilitator at the moment that is needed. 2. Creating and holding a safe enough space is heavily influenced by the relationship of the facilitators. What a great learning! I was not aware of it until some participants approached me and said: “Yannis, we feel safer to open up as we experience the loving and nurturing relationship you have with Esther”. “The way you two facilitate the whole process creates an amount of trust that allows us to bring our courageous self in”. I was deeply touched by that and I reflected on how we as facilitators have created the strong bond of our relationship: Frequent meetings, hard work with appreciation to each other’s ideas, mutual respect, acknowledgement and honoring of our cultural differences, testing our courage edge together out in the real world beforehand, and creating a ritual about the way we meet in our diversity. All the above-mentioned provided a safe enough environment for us to operate. So, it seems like a parallel process has taken place: The moments of deep connection during the preparation time had informed our onsite facilitation practice and impacted the participants and the “space” accordingly. 3. Invite people to an impact-full social intervention related to the theme of your event (if possible). It is transformational in all levels. Graphic facilitators are an indispensable part of an event if we want to leverage collective harvesting. They seem to work a bit in “isolation” in respect to the field of action, having most of the time, their back turned to the audience, however with attentive ears. This year at Berlin Change Days, Kristel Bodensiek did a fantastic harvesting. As most graphic facilitators, she worked “at the edge” of the space and the process, so her view becomes very important as she moves in and out of an imaginary boundary. We invited her at the closing of every day not only to “re-draw” and make us feel included in the flow of her scribing but also to speak out her perspective and embodiment on what was happening in the room. As the spot light turns on her voice and her artefact at the same time, participants have the unique opportunity to reflect on their learning paths from a different perspective as well. 5. The place is an ally. Treat it with respect and it will pay back. The place where you operate and co-exist with the participants as a facilitator, plays a big role on how the process that you have designed will evolve. It may sound bizarre but the place has an identity, it “breathes” with you, it becomes sacred in times that participants open up from a place of vulnerability, it can be hospitable or disturb a process according to how it is “treated”. In one word it has a presence. For example, if you decide a circle for a set up (which is wonderful by the way and also accentuates the place), then try to avoid any “noise” in the room like, bags, coats, cups of coffee under or beside the chairs, food, etc. and ask participants to kindly contribute to that. Every morning, use a ritual in order to “clean” any concentrated energy left from the previous evening. If we consider that one of the circle principles is to take care of the well-being of the circle, then caring for the place that hosts it, becomes essential for a healthy process. 6. Story as a priming of the field invites possibilities for further collective action. Most of us have experienced in our lives the power of stories in terms of enhancing connections with others. Story works as a container and an enricher of our emotions. I also find pivotal to invite Story-Work in our professional initiatives as it further supports sense making and by that influences our decision making. At Berlin Change Days, we introduced Story-Work during the first day, in the format of “Stories of Courage”, in order to prime the field for what was planned to follow the next day: The invitation to participants to go out in the city and act from a place of challenging their courage edge. During the storytelling process we invited the participants to step in the practice of deep, unconditional listening of the other, a rare quality in today’s organizational sphere. If a core quality of a facilitator is to be present and attentive, then story is the most appropriate vehicle because story requires and engenders presence. And if we think of love as a change model, then presence is integral as we can only feel loved in another’s presence. Kreativität, Innovation und Transformation sind als Phänomene in jeder Organisation erwünscht. Sie entspringen der Auseinandersetzung mit Andersartigkeit und Vielfalt. Oft ist unsere Furcht vor dem ‚Anderen’ jedoch größer als dessen Reiz. Warum? Je stärker die Andersartigkeit, desto größer die Intensität der Spannungsfelder. Je bunter die Vielfalt innerhalb einer Gruppe, desto größer die Anzahl der Spannungsfelder. Und kraftvolle Spannungsfelder münden nun auch das ein oder andere Mal in Konflikt. Ohne Frage, Konflikt ist furchteinflößend. Es ist der schwierigste Teil ein jeder Beziehung. Dazu kommt die Kraft des Konflikts Emotionen an die Oberfläche zu bringen, wohingegen wir unsere Gefühle doch sehr gerne ‚unter Kontrolle’ haben. An der Stelle ist es wichtig sich bewusst zu machen, dass das längerfristige Verdrängen von Konflikten zu emotionalen Blockaden führt. Phänomene wie Nörgelei, Wutausbrüchen und/oder Depression sind die Folge. Das gilt sowohl für Beziehungen als auch Organisationen. Je mehr wir Konflikte unterdrücken, desto mehr geht uns an Begeisterung, Kreativität und Miteinander verloren. Der Philosoph Byung Chul Han schildert diesen Zusammenhang in seinem Buch ‚Agonie des Eros’ und begründet eine entstehende gesellschaftliche ‚Depression’ in unserer ständigen Suche nach Harmonie, Gleichheit und Gemeinsamkeit. Eine gesündere und nachhaltigere Haltung ist das ‚Ja zum Konflikt’. Wir können jeden Konflikt als Energiequelle und Wachstumschance begrüßen. Denn wird ein Konflikt erfolgreich ausgetragen - transformiert - setzt das kreative Energie frei und eine neue und bewusstere Form des Miteinanders kann entstehen. Das gilt für innere Arbeit, Beziehungsarbeit und natürlich auch in Teams und Organisationen. Wie geht man mit Konflikten und Spannungsfeldern in Organisationen um? Ende der 80er Jahre hat Arnold Mindell den Deep Democracy Ansatz entwickelt und zahlreiche Prozessbegleiter (‚Facilitator’) arbeiten seither sowohl in politischen Krisengebieten, als auch im westlichen Organisationsumfeld. Deep Democracy ist Modell und Methode und gibt neben der linear logischen Argumentation auch den nicht linearen emotionalen Aspekten in der Beziehungsarbeit Raum. 1. Es startet mit einigen vorbestimmten kurzen Rednerbeiträgen (ca. 5min), die eine Bandbreite an Meinungen aufspannen. 2. Im nächsten Schritt wird der Dialog für dasPublikum geöffnet. Neben der Vielzahl an Meinungen werden auch Polaritäten bzw Spannungsfelder transparent. 3. Dabei werden auch Stimmen laut, die im Allgemeinen in der Gruppe tabuisiert werden (sogenannte ‚Ghostroles’). 4. Das Vertiefen eines oder mehrerer Spannungsfelder führt zu einem neuen Verständnis auf beiden Seiten. 5. Die Rolle des ‚Facilitators’ ist nicht den Prozess zu kontrollieren, sondern ihn bestmöglich zu unterstützen, so dass Transformation möglich wird. Am Ende des ersten Tages vom BEYOND STORYTELLING werden wir ein Open Forum veranstalten. Das Open Forum wird die Rolle von Storytelling in Zusammenhang mit dem aktuellem Zeitgeschehen reflektieren. Wir möchten Sie einladen, das Thema gemeinsam mit uns zu gestalten.